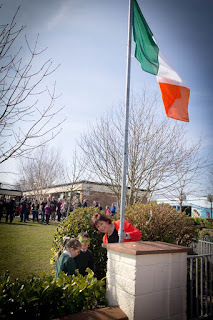 On 15 march 2016, every primary school raised the national flag in special ceremonies, during which the student’s proclamation were also read. Pictured are Principal, Catherine Power and junior infants raising our flag. We were delighted to have such a large turnout, thank you to everyone who came to see all of the great work put in by the students.